Mohammed Wasay and his World Brain Day (WBD) team have again prepared numerous activities for individual member societies to join with to celebrate the formation of the WFN on July 22. This year, the theme is Clean Air for Brain Health (and healthy brain development). Since 2016, the Department of Neurology of Cheikh Anta Diop University of Dakar has become the third WFN Teaching Center in Africa. During the process of accreditation, the WFN officials were informed about the different training available. Epileptology training was initiated several years ago, and more than 50 African neurologists, pediatricians, psychiatrists, and neurosurgeons were trained. A training on clinical neurophysiology was in progress at that time. A year after this accreditation, in 2017, a one-year training on clinical neurophysiology was born. 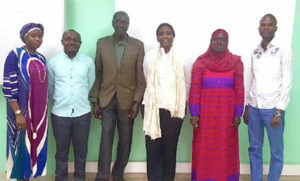 This first training program includes four workshops on basic aspects of neurophysiology, electroneuromyography (ENMG), electroencephalography (EEG), evoked potentials (EP), and an intensive practical done in the clinical neurophysiology unit of the Ibrahima Pierre Ndiaye Department of Neurology in Fann national teaching hospital of Dakar under supervision of faculty members. In March 2018, after a theoretical and practical evaluation, the Neurology Department of Dakar graduated the first batch of clinical neurophysiology training. The recipients were two women (Dr. Fatoumata Ba from Senegal and Dr. Prisca-Rolande Bassolé from Burkina Faso) and two men (Dr. Daniel Gams Massi from Cameroon and Dr. Hermann Ngoma from Congo Brazaville). Department of Neurology, El Hadj Ibrahima Niasse private University-Saint Christopher Iba Mar Diop School of Medicine of Dakar, Senegal. Department of Neurology, Cheikh Anta Diop University of Dakar, Senegal. Department of Clinical Sciences, Faculty of Medicine and Pharmaceutical Sciences, The University of Douala, Cameroon. Department of Neurology, Faculty of sciences of health-Marien Ngouabi University, Congo Brazzaville. Neurology Department of Gaston Berger University of Saint-Louis, Senegal. I welcomed my nomination for the WFN-JTF 2017 with pleasure and attended the 32nd International Epilepsy Congress Sept. 2-6, 2017, in Barcelona. (I would like to thank the WFN for giving me this opportunity. It was with great attention that I followed the several congress sessions. The ones that interested me most were the video sessions, in particular, those relating to seizures and epilepsy in neonates and the cases oriented series. Through the sessions on the new classification of epilepsy, epileptic encephalopathies concept treatment and outcome, and advanced EEG, I benefited from the advice of experts and updated my knowledge in epileptology. Attending this conference also allowed me to present my poster whose research theme was betamethasone in the treatment of West syndrome. In fact, betamethasone is not a common oral steroid used in West syndrome. In our practice in Dakar, we use it because of its availability, low cost, and easy route of administration. In addition to meeting with leading experts in the field of epilepsy, I also made new relationships for my future neurologist career. I am a neurologist and researcher working at Neurogenetics Research Center of Instituto Nacional de Ciencias Neurológicas in Lima, Peru. I’m grateful to WFN for supporting my attendance at the 21st International Congress of Parkinson’s Disease and Movement Disorders in Vancouver, BC, Canada. This scientific meeting attracts delegates from around the world to learn the latest research and best evidence-based clinical guidelines on the field of movement disorders. 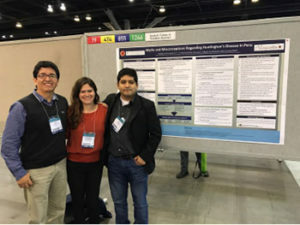 Together with two colleagues, I presented two posters: one case of Familial Creutzfeldt-Jakob Disease, with an E200K mutation, and a qualitative study regarding Myths and Misconceptions Regarding Huntington’s Disease. This meeting allows me to update my knowledge regarding clinical practice on movement disorders and neurogenetics, meeting with current collaborators as well as networking and looking for future collaborations. By Wolfgang Grisold, on behalf of the WFN. The Austrian World Summit R 20 took place May 15, 2018, at the Imperial Palace in Hofurg. This was a high-level meeting dedicated to the environment. It was organized by the Schwarzenegger Institute and members of the Austrian government. High-ranking speakers were international, and included Antonio Guterres, U.N.; Erna Solberg, Prime Minister of Norway; L.L. Rasmussen, Prime Minister of Denmark; Maros Sefcovic, E.U. commission; Jane Godall, U.N. Messenger for Peace; Li Yong, UNIDO; and Fran Pavley, former California state senator. The Austrian Chancellor S. Kurz gave an opening speech, which was briefly interrupted by a flash mob of environmental activists. The Austrian President Van der Bellen and Arnold Schwarzenegger gave keynote lectures. All main sessions had keynote speakers and panel presentations. The theme was introduced by a dramatic video and sound presentation, showing effects on the environment and climate in many areas of the world. The U.N. secretary affirmed the need for the protection of the environment. Many speakers lamented the fading effects of Paris, and the new policy of the U.S. in ignoring the effects of environmental damage and global warming. In his keynote address, Schwarzenegger emphasized that local and regional governments are powerful and need to be empowered. As an example, he cited California with a decrease in carbonization. Despite the fear that these environmental activities would harm the state the economy is booming. Home pollution in the developing world was another important topic. In many countries, burning wood and coal indoors creates significant pollution. This also refers to water, which often needs to be boiled with energy-consuming and polluting energies to avoid infections. The Vice Mayor of Beijing talked on its successful fight on smog. The town of Katovice, Poland was presented as a successful campaign. Katovice is a traditional miners’ town that had been severely polluted and had several successful interventions to restore the environment. By the end of this year, another environment summit will be hosted there. Among the examples of successful campaigns was an inspiring lecture by Mr. Piccard, who finally successfully navigated a trip around the world in an sun-powered electric plane. The afternoon sessions had main topics, such as sustainable investments, from action to transaction, building cities in the future, interactions of cities and surroundings, smart energy solutions, sustainability and tourism, and strategies to tackle pollution, in concurrent sessions. Other topics included renewable water preparation methods, European law in regard to the right of clean air, and a lecture by Fran Pavley, former California state senator, on the development of the environmental movement and success in California. I was also able to speak personally to Mrs. Pavley and introduce her to the activities of the WFN. My name is Dr. Wolfgang Grisold. I am a neurologist from Austria, and I want to apply for a second term for the position of the secretary general of the World Federation of Neurology (WFN). My main motivation to keep the position as secretary general is to ensure continuity and coherence. Over the past years, I was strongly involved in realizing various successful initiatives, projects, and global cooperations on behalf of the WFN. Pursuing these efforts, strengthening global connections, and applying best practices to new projects will be at the heart of my agenda. My work as secretary general is driven by the conviction to understand and build upon the needs of neurological patients worldwide. Equally important is also the prevention of disease. In that regard, the WFN has realized a number of initiatives, such as patient education and the patient days at the World Congresses of Neurology (WCN). I am convinced that these initiatives will need to be further developed and included firmly in our culture. I have been an elected trustee of the WFN since 2009 and was elected as both the secretary general and treasurer at the 2013 WCN in Vienna. The separation of the two functions, executed in 2015, was an important move for the improvement of the structure and governance of the WFN. In the position of the secretary general, I was in close contact with the officers, the trustees, and our member societies. The WFN traditionally has several committees, which focus on specific topics and are a valuable source of advice for the WFN. Also the Applied Research Groups (ARG) aim to increase the scientific standards in neurology worldwide. It is an important task of the secretary general, that both the committees and the ARGs are close to the officers of the WFN and work synergistically. During the past years, the WFN streamlined its organization, and in addition to the previous agenda, it has been able to successfully add new activities and agendas. Examples are the well-established educational activities such as Junior Traveling Fellowships, department visits, and the creation and implementation of WFN teaching centers. These activities have been developed over several years, and I was involved in establishing and promoting these activities. We are also proud to be able to keep up the WFN-AAN Palatucci course at our world congresses, which successfully promotes the important role of advocacy of the WFN, as an important symbol of importance. 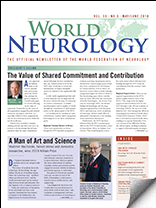 The WFN has also been successful in working with other societies in global activities such as the Global Neurology Network and the World Brain Alliance. The World Brain Day has promoted several topics, as for example epilepsy with the ILAE and stroke with the WSO. The World Brain Day was established at the WCN 2013 in Vienna, in particular by the advocacy committee chaired by Prof. Wasay. Through joint efforts with the WFN London office and trustees, and professional press support, it gained sustainable and quotable success. As mirrored by countless press quotes, the World Brain Day has a far-reaching international effect. The communicative efforts of the WFN are individually strong but still need a more synchronous appearance to be even more effective. In addition to the Journal of Neurological Sciences, eNeurologicalSci is now indexed in Pubmed. Our newsletter World Neurology, the WFN social media and WFN website, including the new video platform, are drawing global attention to promoting neurology, and serving the interests of the society, and still have a great potential for further development for education. 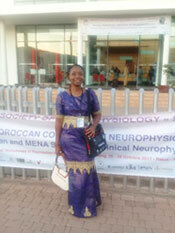 I am a young Cameroonian neurologist from Senegal. I have just finished my training. I have seen interest in the field of clinical neurophysiology and epilepsy. It was possible for me to attend the Second Moroccan Congress of Neurophysiology associated with the first African and MENA seminar of clinical neurophysiology Oct. 26-28, 2017, in Morocco, due to the World Federation of Neurology Junior Traveling Fellowship. 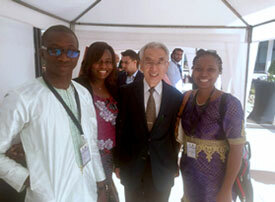 The conference was held at the Mohammed VI conference center, a scenic place located in Rabat. I presented my abstract on movement disorders in HIV patients at the congress. I also took teaching courses and workshops on epilepsy, EEG, and EMG. The lectures on electrodiagnostic examination of patients with myasthenic syndrome done by Prof. Shri Mishra and principals and pitfalls of motor and sensory nerve conduction studies by Prof. Jun Kimura offered a good perspective. The session on challenges in botulinum toxin in dystonia and spasticity by Prof. Dirk Dressler also addressed some important issues that are relevant in the implementation of any trial. Participation in this congress presented a unique opportunity to discuss my research in all aspects of clinical neurophysiology with many delegates from different nationalities from around the world. 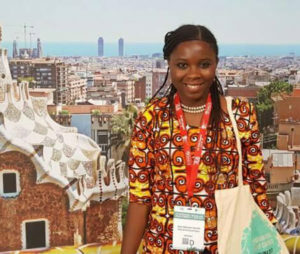 Such conferences help us to perceive that the international community must stay united across frontiers in search of solutions to problems that many epileptic and HIV patient have particularly in Africa: stigmatization and lack of knowledge in order to improve therapeutic care awareness globally. It was an enthralling experience for me. I got an impetus at the right time in my career, and this provided me with a better world view of the field of clinical neurophysiology. 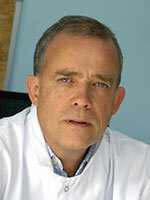 Jean-Marc Léger started his career in neurology in 1980 at the University Hospital Pitié-Salpêtrière and University Pierre et Marie Curie (Paris VI), France, where he trained in general neurology and clinical neurophysiology. He was then nominated as full-time senior neurologist in 1987 in the Department of Neurology, then Institut Hospitalo-Universitaire (IHU) de Neurosciences, University Hospital Pitié-Salpêtrière, and received his post-graduate degree (Habilitation à diriger des Recherches) from University Paris VI in 1991. He is currently co-chair, together with Dr. Eymard, of the National Referral Center for rare Neuromuscular Diseases, that was built up in the IHU de Neurosciences/Institut du Cerveau et de la Moelle Epinière (IHU/ICM), at University Hospital Pitié-Salpêtrière, in 2004. Dr. Léger’s clinical and research interests are in the field of peripheral neuropathy and in particular chronic immune-mediated neuropathy. 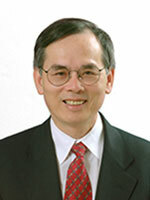 He has authored and co-authored more than 200 articles in peer-reviewed journals, and contributed more than 30 chapters to books on neurology, mainly in the field of diagnostic features and therapeutic trials in vasculitic neuropathy, chronic inflammatory demyelinating polyradiculoneuropathy, multifocal motor neuropathy, and paraproteinaemic neuropathies. He served as editor-in-chief of the Revue Neurologique for eight years and as member of the editorial board of Brain for five years, is currently member of the board of the European Journal of Neurology, associate editor of the Journal of the Peripheral Nervous System, and was appointed as co-editor-in-chief of Current Opinion in Neurology in 2017. Dr. Léger is past president of the Société Française de Neurologie, in which he served as secretary general for eight years. He served as vice president, then officer of the Management Committee of the European Federation of Neurological Societies (EFNS), and as chair of the Training and Education Committee of the EFNS. 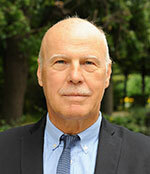 He acted as chair of the Local Organizing Committee of the EFNS Congress in Paris in 2004. He is also past member of the Board of the Peripheral Nerve Society, and organized its biennial meeting in Saint-Malo, France, in 2013. He is a fellow of the American Academy of Neurology (FAAN), corresponding fellow of the American Neurological Association, and was nominated as fellow of the European Academy of Neurology (FEAN) in 2018. He also acted as delegate of the SFN at the WFN Council of Delegates from 2005, and actively participated to the World Congresses of Neurology from 2001. He actively participated in the International Congresses on Neuromuscular Diseases (ICNMD) organized by the WFN Research Group in Neuromuscular Diseases for 20 years, being a member of the Congress Programme Committee of the ICNMD International Congresses in Nice 2014, Toronto 2016, and Vienna 2018. He actively participated on behalf of the SFN/EFNS/EAN/WFN in International Teaching Courses in Tunisia, Morocco, Egypt, Syria, Jordan, Lebanon, Czech Rebublik, Moldova, Turkey, Georgia, Saudi Arabia, Iran, Russia, Senegal, Vietnam, China, Chili, Brazil, and Australia. I am honored to be nominated for the position of the WFN Trustee. The achievements of the WFN for more than 50 years of its history are tremendous. I hope to be able to contribute to the accomplishment of the WFN mission – to foster quality neurology and brain health worldwide – on the background of my clinical, academic, and administrative expertise and the experience gained while being involved in clinical practice, research, high-level initiatives, and events in epilepsy, stroke, cognitive impairment, and other brain diseases in collaboration with WHO, as well as professional organizations in many areas of neurology. Neurology has been a vital and integral part of all my life. I inherited the passion regarding neurology from my late father. I was fortunate to have outstanding mentors, and now I am happy to teach young doctors, guiding them in clinical practice and research, with more than 25 completed PhD and doctoral dissertations. With a background in general neurology, I have been taking care of patients for 30 years. My PhD was in EEG monitoring in carotid surgery and doctoral dissertation — in brain plasticity and restoration after stroke. 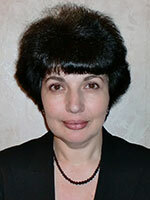 Currently, I am doctor of medical sciences, director of Moscow Research and Clinical Center for Neuropsychiatry, professor of neurology at the Russian National Research Medical University, supervising the regional stroke center and neurological clinic in the huge multidisciplinary hospital in Moscow. My main areas of research are epilepsy, post-stroke cognitive impairment, restoration after stroke, and neuroepidemiology. I have the privilege of being a member of the editorial boards of the Journal of the Neurological Sciences, the WFN journal, European Journal of Stroke, Acta Neurologica Scandinavica, author of more than 170 PubMed-listed publications, including over 60 papers in peer-reviewed international journals and book chapters, several books/ manuals, and national guidelines. I received several prestigious international and national awards, including the AAN Bruce S. Schoenberg Award. Of more immediate relevance to the nomination for the WFN trustee is my expertise gained while working for more than 15 years on the WFN Education Committee. I am proud to belong to the team fostering the education worldwide and successfully developing important educational initiatives, including Continuum. Being involved in the international collaboration through education, several Eastern European countries eventually joined the WFN. I am the secretary and the WFN delegate of the National Society of Neurologists. For several years, I worked as the chief neurologist of Moscow, where meaningful improvement of care for patients with stroke, epilepsy, and multiple sclerosis has been achieved. WFN maintains strong partnerships with the World Health Organization — a rare privilege among professional organizations. 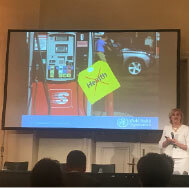 I acquired experience that may be useful for the WFN and the World Brain Alliance, as for many years I have contributed to the significant WHO activities in non-communicable diseases, including the 68th WHA Resolution on epilepsy, mhGAP, and several WHO initiatives in dementia and Parkinson’s disease. I feel privileged to be involved in the work on bringing back stroke to neurological diseases in ICD11, which is a major achievement for future neurology. Following our president’s approach to develop cooperative strategies, I can be instrumental in promoting productive and effective collaboration, also in the framework of the World Brain Alliance, with the key professional organizations in brain diseases, namely, International League Against Epilepsy (ILAE) and World Stroke Organization (WSO), where I am honored to be significantly involved, being the ILAE vice president, member of the WSO Educational Committee and Steering Committee of the Action Plan for Stroke in Europe. For many years, I have been an invited lecturer/chair to the WFN, EFNS/EAN, ILAE, and WSO Congresses; a member of the Organizing/Program Committees of the international and national meetings in brain diseases. I came from a country situated geographically in Europe and Asia with many regions different in their ethnic, cultural, economic, and historical background. I have been involved in developing neurological education and care in Eastern Europe, managing a range of available resources, from quite appropriate to limited; this experience in recognition and addressing specific needs could be of value in implementing the WFN mission. There are many examples that women can effectively contribute to medicine, research, and administration. WFN has no women among the elected trustees; it might be beneficial for the WFN to aim for a gender balance in the leadership.